A mixture of herbs, spices, and seasonings that are used to flavor meats that will be grilled. The blend of seasonings, which originated in Jamaica, includes ground chiles, black pepper, onions, garlic, thyme, cinnamon, allspice, and ginger. 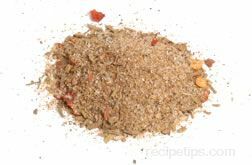 Chicken and pork are the types of meat that are most often prepared with this blend of seasonings. The mixture may be applied as a dry rub to the meat before grilling or liquid may be added to the dry blend to produce a marinade in which the meat is soaked before it is cooked. Commercially prepared blends are available in many supermarkets.